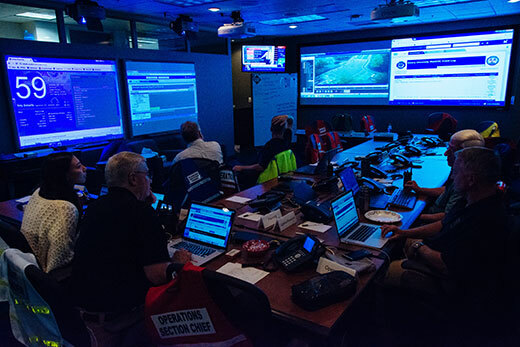 As Hurricane Irma approached last September, Emory's Emergency Operations Center was a central clearinghouse for monitoring and responding to the storm's impact. The university's Atlanta and Oxford campuses suffered downed trees, but no significant damage or injuries were reported. Emergencies are unexpected, but when one occurs, knowing what to do — or simply where to look for help and resources — can be key to minimizing danger. The Office of Critical Event Preparedness and Response (CEPAR) notes that the launch of a new academic year brings with it a reminder for the campus community to prepare for the unexpected, from updating contact information within Emory’s Emergency Notification Program to discovering which campus locations have been designated as storm shelters. September is National Preparedness Month, scheduled each fall in partnership with the Federal Emergency Management Agency to help communities be better equipped for the risks of accidents and disasters. Taking a few simple steps now to learn more about campus resources can make all the difference during an unforeseen disaster, says Alexander Isakov, CEPAR executive director and associate professor of emergency medicine. "Nobody really knows how they would react in a crisis or emergency immediately evolving in front of them," Isakov says. "The preparedness and disaster resilience of our community depends, in large part, on the preparedness and disaster resilience of each of us as individuals. "Understanding the risks, being aware and dedicating even a little time to prepare for emergencies makes you disaster-resilient and can save lives," he adds. At Emory, emergency resources are in the palm of your hand, by using LiveSafe, a free mobile app. Quickly access a range of important campus safety resources, including information about emergency procedures, and health and wellness contacts. Receive push notifications of campus safety notifications and emergency alerts. CEPAR also developed the Emory University Preparedness Checklist, which provides directions for enrolling or updating emergency contact information in order to receive alerts in the face of severe weather, industrial accidents or police emergencies. Basic safety information and reminders, such as a prompt to program phone numbers for Emory police departments — and adding an "In Case of Emergency" (ICE) number — into your personal mobile phone. Suggestions for establishing a simple emergency communication plan, so family and friends have an agreed-upon way to make contact during a campus or regional emergency. Prompts for knowing how to exit buildings if a primary pathway is blocked and where to seek shelter during severe weather. Handy contact information for campus emergency services, including health and counseling services, and the Emory Faculty Staff Assistance Program. To stay abreast of the latest campus emergency notifications, in addition to email alerts you can also receive personal text alerts by ensuring that you are registered in Emory's Emergency Notification Program. "Emergencies aren't just hypothetical situations, they do occur. Having the right information, and understanding what you need to do, makes you better prepared and more resilient. " says Sam Shartar, senior administrator for CEPAR. Shartar suggests programming two "short codes" — 226787 and 678283 — into your list of cellphone contacts, along with unique ringtones, to quickly and easily identify an Emory emergency alert. "In the event of emergencies, when trying to let others know that you're okay, we suggest texting instead of talking," Shartar adds. "Phone calls take up a lot of bandwidth, whereas texting takes up much less bandwidth and still accomplishes the task." For Emory faculty, staff and students, the new semester is a great time to become familiar with the university’s emergency resources, Shartar says. Reviewing the CEPAR website is a good start. Just as people test the batteries in their smoke detectors annually, taking time to review Emory’s emergency procedures in LiveSafe or the Just-In-Time guide should be considered a yearly ritual, he suggests. These wide-ranging resources also offer guidance for what to do in the face of a variety of emergencies, including power failures, water and gas leaks, medical emergencies, chemical spills or laboratory accidents, and severe weather and weather-related campus closures. "It will get you thinking about what you could anticipate in the event of a tornado, a police emergency, or what to do during winter weather to protect yourself from snow and ice," Shartar explains. Talking with colleagues about basic office safety protocols, such as knowing where to take refuge during a tornado warning or an active shooter incident. Exercising caution about letting people into a locked building unless they've been properly identified. Calling the Emory Police if you note suspicious behavior in the workplace. Scheduling a Crime Risk Prevention Workshop with the Emory Crime Prevention Unit. Taking a first aid class and learning CPR. Knowing where the nearest automated external defibrillator (AED) is located in your building and learning how to use it. Following @EMORY_CEPAR on Twitter to receive monthly preparedness tips and emergency messages. Programming the Emory Police Department number 404-727-6111 into your mobile phone.